E-newsletter - September 2014 - Bottom Line Underwriters, Inc.
Is your referral program working? Should you even have one? And if so, what should it look like? In part four of our series on developing a repeat and referral business, we’ll examine these questions, and discuss what other successful salespeople across the country, those who derive the majority of their income from repeat or referral clients, are currently doing. In every market we’re currently in, there are a few sales professionals who fit this bill. And some don’t even take new customers (fresh ups) anymore. To find out if our referral program is working, all we have to do is figure out how many referrals we sold in the last 90 days and what percentage of those required us to invest in referral incentives. If the answer is two or three sold referrals a month and zero referral fees paid out, then the answer is fairly obvious. The validity of this test depends on how long we’ve been in the business, of course. But if we’ve been selling for five years or more, and these were our results, then it ain’t working (or we aren’t)! So should we even have a referral program? Not if it’s the mindless $50 bird-dog fee administered in a haphazard fashion. I’d bet my next paycheck, if that’s our idea of a referral program, it’s not working very well for us right now. About half (and it IS roughly half) of the successful sales pros we’ve interviewed do NOT use any kind of formal or published referral program. They rely simply on their reputations for delivering excellent service to drive business their way. Some will pay for the occasional dinner for two, or concert tickets, etc. to those clients who either purchase several cars from them or have sent several referrals in the past. But for the most part, this half of the marketing world we visited with believe being skilled, concerned, and committed to delivering outstanding customer service is enough. The other half employ various incentives to drive referral business to them. None, none that we’ve interviewed anyway, have had any success using the traditional (read “tired”) $50 bird-dog fee mentioned earlier. Some will spring for a nice dinner for two for every referral sent to them. They usually set up an account with one or two of the nicest restaurants in town. Then they’ll simply ask the referring client to mention their name when making reservations, so the restaurant will know to bill the salesperson’s account. (One salesperson told us they had a customer use their name for more than one dinner, so now he calls the restaurant beforehand to “approve” each referral dinner.) Some have fancy certificates printed up that the restaurant approves ahead of time and agrees to honor. Some sales people include alcohol, some don’t. Some sales people include the gratuity, and some don’t. Some use a set dollar amount, like on the certificates, but most don’t. A few sales people like to send referring clients tickets to a concert, or a play, or a sporting event. Quite a few of these maintain season tickets for this purpose (reminding us that they are tax deductions after all). Some will send them car accessories, or wine baskets, or other gifts like that. You think that might catch someone’s attention? I’m sure that all of us can come up with other ideas just as clever and just as effective. If not, we can use these ideas that have already been proven to be effective. One sales person told us that he alternates between incentives each quarter and uses his newsletter to publicize what he’s doing next. But we must make a decision! Are we going to use an incentive for referrals or not. (Remember, roughly half of those we talked with choose not to use incentives). If we choose to employ a referral incentive, then we need to publicize it, and use it whenever or where ever we can to drive business our way. Please let me know how it’s working for you, okay? Until next time, be well, and do good work! 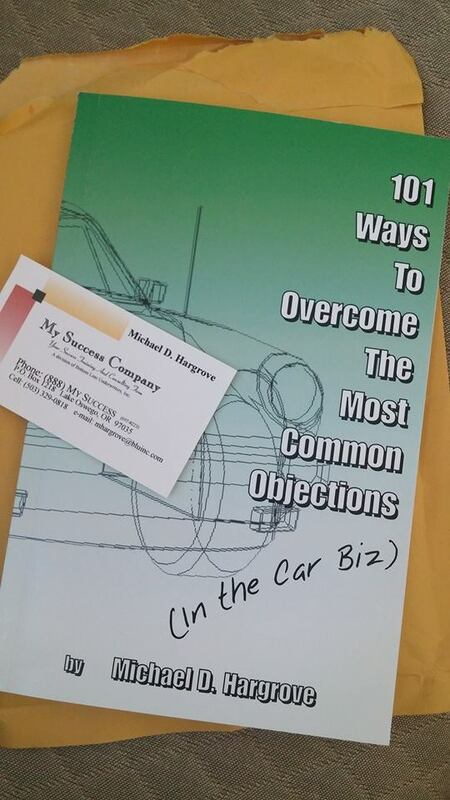 Next month’s objection will be: “I’m just looking, not buying today.” We need YOUR input!!! Please forward your ideas on this one, or your suggestions on which objection to cover next, to editor@bluinc.com. One night, at 11:30 pm, an older African-American woman was standing on the side of a Alabama highway trying to endure a lashing rain storm. Her car had broken down and she desperately needed a ride. Soaking wet, she decided to flag down the next car. A young white man stopped to help her – generally unheard of in those conflict-filled 1960s. The man took her to safety, helped her get assistance and put her into a taxi cab. She seemed to be in a big hurry! She wrote down his address, thanked him and drove away. Seven days went by and a knock came on the man’s door. To his surprise, a giant combination console color TV and stereo record player were delivered to his home.